MIDIbox SEQ V4 Lite (in short: MBSEQV4L) is a minimalistic but powerful "MIDI sequence looper" which allows to apply various MIDI effects to spice up the original recording. The sequencer never has to be stopped! Even when a new sequence should be entered, loaded or stored from/on a SD Card, MIDI effects are added, etc. It will always run in sync with the internal or externally supplied clock. Following samples demonstrate the MIDI effects which can be applied on a recorded sequence. The instruments are controlled by MBSEQV4L itself, drums have been added on some samples, they are played by an external drum machine and synchronized via MIDI clock to MBSEQV4L. Step Progression: the original sequence is played on the first 4 bars, thereafter different step progression modes (backward/forward/repeat/skip) are selected to show the difference. This feature is especially useful for stretching a sequence. When it's turned off again, the sequence is automatically synchronized to the measure. Groove Styles: different groove styles are selected after the first 4 bars. A groove style varies the velocity, note delay and note length. Extreme settings have been used so that the effect can be noticed. Echo: the MIDI echo effect repeats notes after a predefined delay. In addition it lowers (or increases) the velocity. Some selections even increase/decrease the note value of the repeated note (used at 0:13), which works perfectly if the Force-to-Scale function is enabled! Echo: another echo demonstration on a different sequence with an instrument which doesn't react on different velocity values. LFO: the LFO effect varies note value, velocity and length based on a periodic sine or saw waveform which spans 16 or up to 64 steps. Some LFO settings can also vary CC values. In this demo different LFO modes are selected at 0:04 - the result sounds like typical "berlin school" sequences, and we will get them with a single push on the button! LFO: another demonstration on a different sequence. Humanizer: this effect randomizes note value, velocity, length and CC values. It especially works well with natural instrument emulations, resp. synths which select different sounds based on velocity, as demonstrated in this sample. MBSEQV4L is a derivative of MBSEQV4 with reduced control surface and feature set, tailored for a single usecase: using it during a live session! The firmware contains the same sequencing engine like the original V4, but only provides access to the most important functions, such as various MIDI effects. Instead of entering effect parameters directly, 15 presets are available per effect. This reduces the possibilities, on the other hand the prepared setups are working well and they are available immediately with a single push on a button. Note, Pitchbender and CC values can only be entered by recording the MIDI events from an external MIDI keyboard. Step and Realtime (Live) recording are supported, both are useful! Use Step Recording to quickly enter some notes/chords on selected steps, use realtime recording to enter notes and CCs on-the-fly at the position which is currently played by the sequencer. Although MBSEQV4L plays 16 tracks at once, only two sequences (Seq1 and Seq2) are available, because each sequence allocates 8 tracks. The first three tracks are used to store Note/Velocity/Length, layered to up to 16 notes polyphony per step. The remaining 5 tracks are used to store Pitchbend and CC values at high resolution. Each track stores 4 CC layers, accordingly up to 19 CC lines can be recorded. Both sequences are working independent from each other. It's possible to apply different MIDI effects, and to select an individual MIDI channel. Parameter changes can also be done for both sequences by selecting Seq1 and Seq2 together. The sequence length is selectable from 1 to 64 steps. Longer sequences would require more Bar buttons and LEDs, therefore they are not supported to follow the philosophy "only directly selectable functions are available". In general you will notice, that all functions have a dedicated button. With two exceptions (Scale button and the "general purpose" buttons) no double assignments are used to simplify and speed up the usage. Both sequences can be stored (and restored) on/from a SD Card. The session format is compatible to MIDIbox SEQ V4, therefore it's possible to exchange patterns. This also means, that it's possible to play back a 16 track sequence which has been created on MBSEQV4 - use MBSEQV4L as a simple playback machine! Only a single session is available, which consists of 64 patterns. If you need more patterns, just swap the SD Card. This can be done during runtime without power-cycling the hardware. 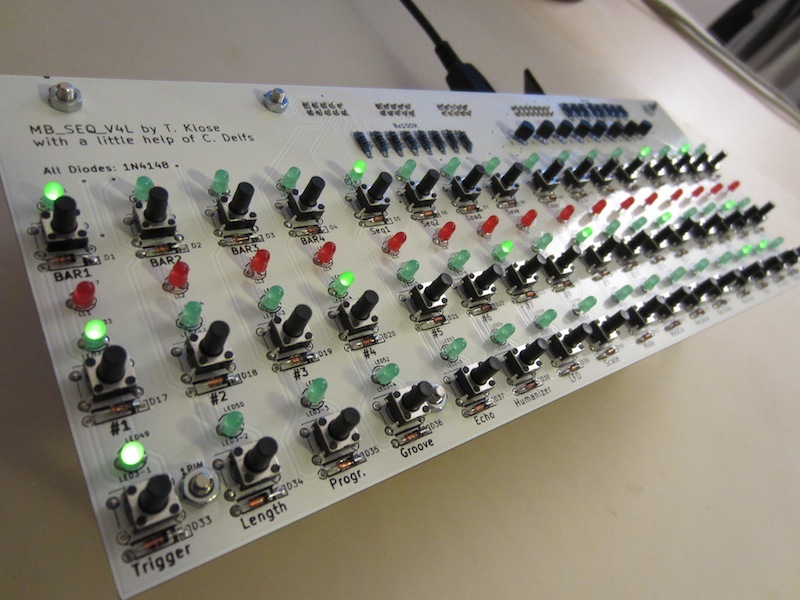 The sequencer can be synchronized to an external MIDI clock, or it can be clocked internally. In this case the tempo has to be entered with the "tap tempo" function. MBSEQV4L switches automatically from MIDI Clock master to slave mode once it receives a clock over any MIDI IN. The MIDI Clock Slave mode supports a special synchronization mechanism: if you are pushing the Start button, the sequencer won't start immediately, but with the next 16-step bar of the master clock. We find this especially useful in live situations, because it prevents that MBSEQV4L starts with the first step "in between" the measure given by the master clock. MIDI events are output on MIDI OUT1 and USB. The remaining MIDI OUTs only output a MIDI clock. Optionally it is possible to send OSC datagrams via Ethernet. A planned option is to play sequences via a directly connected CV interface. Here we have the same situation: working, but configuration is too difficult, therefore not documented. MIDI events and clocks are received from all available MIDI INs, USB and OSC (Ethernet). 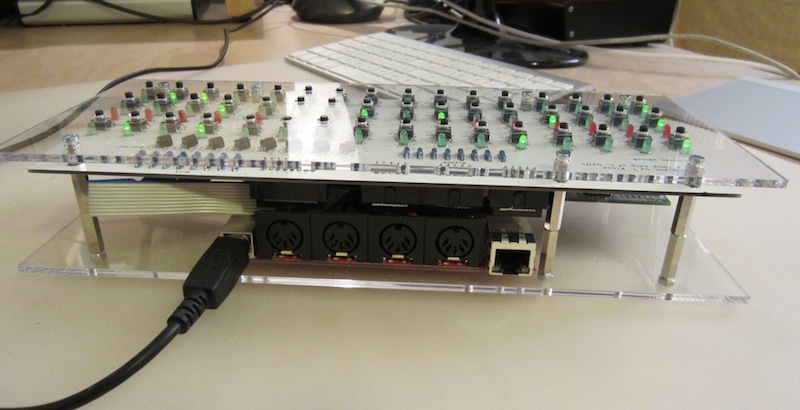 A MIDI Router is available which forwards incoming MIDI events to MIDI OUT1, USB, OSC, CV Out when enabled ("IN->OUT" button). This means, that a synth could be used in "local off" mode, so that MIDI notes played on the keyboard will be routed through MBSEQV4L before they are played. A complete kit isn't planned yet for this project due to the difficult and time consuming handling. Premade PCBs are available as well, but due to the DIY friendly design the circuit could also be built on verboards. Note that for MBSEQV4L it isn't required to cut the LPC Link part of LPCXPRESSO since it nicely fits under the frontpanel. See MBHP_CORE_LPC17 page: ca 24 EUR. module The LPCXPRESSO module is hooked on this board. Christian created a nice minimalistic acryl case, see also this forum article. By using this .svg file it can be directly ordered at Formulor in Germany. Some guys already considered to create a new Ponoko Case, please follow the thread regarding this topic. Alternative cases are definitely welcomed!!! Additional notes to distance between frontpanel and PCB: transistors have to be clipped after soldering so that they fit under the case. Sometimes it might also be necessary to adjust the LEDs if they touch the acryl. This can be done by heading up the legs from the bottom side, and pressing the LED against the PCB - this has to be done quickly (in less than 5 seconds), so that the LED won't be heat up too much! BPM LED Digits (require two DOUT) Shift registers connected to J8/9 of the core module. BPM Encoder (requires one DIN) Shift register connected to J8/9 of the core module. 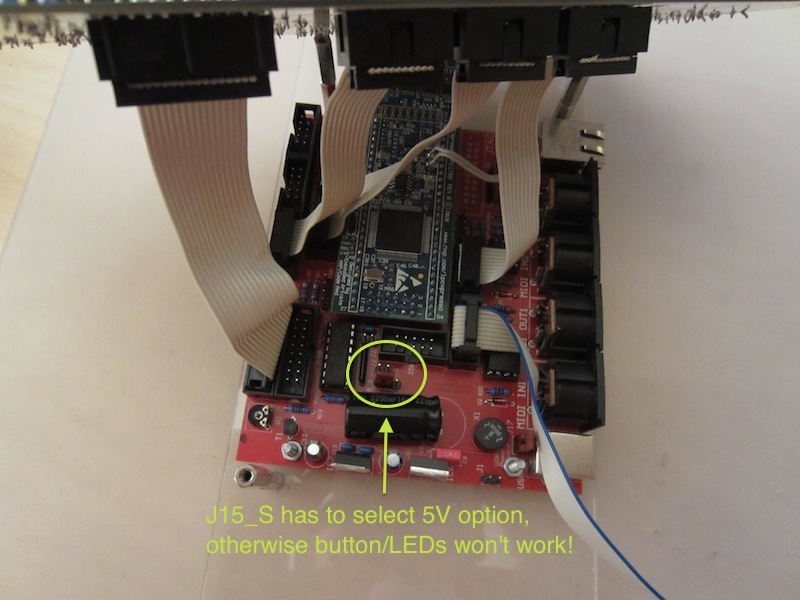 See the MBSEQV4 Hardware Manual for further details. The MIDIbox SEQ V4L firmware is released as a precompiled binary, which can be easily updated via USB MIDI by using MIOS Studio. Details about the bootloader are explained here. If this procedure sounds unfamiliar to you, please follow the hardware test procedure first as explained in the MBHP_CORE_LPC17 page. download the latest midibox_seq_v4l_* release package from the MIOS32 Download Page. once the "Upload completed" message is displayed by MIOS Studio (after ca. 20..30 seconds), your MIDIbox will reboot, and the new firmware will be started.. The sequencer will already work without a connected SD Card. In this case, the firmware will hang for the first 5 seconds (to search for the SD Card), the LED will show an animated progress bar. Without a SD Card, Load/Store and the Copy/Paste/Undo function won't work. Once a SD Card is connected the first time, a directory will be created under /SESSIONS/DEF_V4L and pattern banks will be generated. This takes some seconds (ca. 20..30 seconds depending on the performance of your SD Card) - the LEDs will show a progress bar, and the MIOS Terminal will show some messages. Please don't switch off the MIDIbox until this process is finished! Please note also that the firmware contains an integrated SD Card reader function for the USB port, e.g. for the case that you want to swap files or create backups. Just enter "msd on" in MIOS Terminal. Once enabled, the SD Card should be automatically mounted by the operating system (Windows/MacOS/Linux). USB MIDI will be disabled, which means that you have to power-cycle the core after unmounting the SD Card to bring the firmware back to normal operation mode. The firmware release package contains a default MBSEQ_HW.V4L, which can be copied into the root directory of the SD Card if hardware default settings should be modified (e.g. to customize button and LED assignments). This file will be loaded after startup. MIDIbox SEQ Lite enables 4 USB MIDI ports. Unfortunately some windows versions can't handle this correctly: MIDI is stucking sometimes, Filebrowser operations are failing, etc. GP 1-16 The 16 "general purpose" buttons at the middle of the frontpanel are used for various functions depending on the selected page (see descriptions below). Seq1/Seq2 Selects the sequence which is currently edited/recorded. Load Allows to load a pattern from SD Card. This can be done during runtime, the sequencer will be kept in sync! Save Allows to store a pattern on SD Card. Please note that the save operation will take place immediately! Copy Copies the selected sequence(s) into a buffer. Paste Copies the buffer content into the selected sequence(s). (*) All steps and parameters will be cleared. Only the "Force-to-Scale" selection and current mutes won't be touched. Undo Allows to revert the last Paste or Clear operation. Tempo Tap this button 5 times to change the tempo. Master Mode should be enabled to use this function! In addition, this page allows to select the step length. Start Starts the sequencer. In MIDI Clock Slave mode, the sequencer will wait until the master clock starts a new measure before the sequence will output MIDI events. Length In this page the sequence length can be entered via GP and Bar (!) buttons. Any length between 1 and 64 steps is supported. New: the loop point can be set by pressing & holding the Length button! Progr(ession) In this page a step progression effect can be selected. GP1 disables the effect, GP2..16 select various presets from "nice" to "extreme". Groove In this page a groove style can be selected. GP1 disables the effect, GP2..16 select various presets from "nice" to "extreme". Echo In this page an echo effect can be selected. GP1 disables the effect, GP2..16 select various presets from "nifty" to "magic". Humanizer In this page the humanizer effect can be selected. GP1 disables the effect, GP2..16 select various presets from "discreet" to "drunk"
LFO In this page the LFO effect can be selected. GP1 disables the effect, GP2..16 select various presets from "Berlin" to "Detroit"
Activating the Force-to-Scale function is strongly recommended when MIDI effects are selected which vary MIDI Note values! MidiChn. In this page the MIDI channel (1..16) can be selected with the GP buttons. Please note that each Sequence has it's own MIDI channel. Use the same channel for two sequences with independent control of the same instrument. E.g. Seq1 stores MIDI notes for a basis pattern, Seq2 additional notes which will be enriched by MIDI effects, or which are only temporary used and later cleared without destroying the basis pattern. RecArm In this page the automatic track selection for recording can be modified after a Sequence has been selected. Only an "armed" track will be recorded. E.g. if you want to record some new notes, but no CCs during the recording, you could deselect track 4..8 resp. 12..16. Please note that using this page is only required for such special cases. The "arm" selection is automatically set whenever you are switching to another sequence by pressing the "Seq1" or "Seq2" button. RecStep One of the most important pages! Press this button, select a step with the Bar/GP buttons, and play a MIDI note or chord, or send a CC controller/Pitchbender event. It will be recorded into the selected step. Note that the note length will be recorded as well; in order to get some practice with this function, try long and short notes and check how the sequencer plays them back. Whenever a step is selected with a GP button, the previous recording for this step will be deleted once a new note value is entered. This allows you to quickly remove wrong notes if they haven't been entered correctly. The note won't be deleted if CC are recorded. RecLive In this page realtime recording takes place. Start the sequencer and play some notes, they will be repeated once the step position pointer reaches the steps again. CC and Pitchbender values will be recorded as well with high resolution (64th). CCs will be automatically assigned to free track slots (4 slots per track). Advantage: if only a few CC lines are recorded, we've dedicated tracks for PitchBend and CCs (Track 4-8, Layer A) which can be individually muted and cleared. Additional CCs populate the remaining layers from Track 8 backwards, so that PitchBend remains an individual track if not more than 17 CC lines are recorded. Poly Allows to switch between Poly and Mono recording mode. In Poly mode, chords will be stored into a step, in Mono mode only a single (the last played) note will be stored. In->Out Enables MIDI forwarding. Incoming MIDI events will be forwarded to MIDI OUT1, USB, OSC, CV Out. The Force-to-Scale function is applied on incoming events if enabled. If the MIDI IN/OUT port of a synth is directly connected to MBSEQV4L, it's recommended to turn the synth into "local off" mode. Transpose Enables the transpose function: sequences will be transposed based on the key which is played on the MIDI keyboard. If enabled in the Scale page, it's also possible to change the base note of the Scale in this mode. A big thank you goes to Christian Delfs, who gave me some initial ideas, proposed the control surface and created the PCB layout for it.